What to do with two supercars and one impressive motorcycle? Drag race, of course! Motor Trend has done it again, this time with three breathtaking pieces of machinery and one long straightaway. The Lamborghini Reventon is a mid engine sports car that debuted in 2007. The average price of one of these babies is around two million dollars! Rated at 693 hp, its tops speed has been recorded at 211 mph. Ducati manufacturers claim 160 hp and the 0-60 mph time is less than three seconds. Top speeds are estimated around 180 mph. 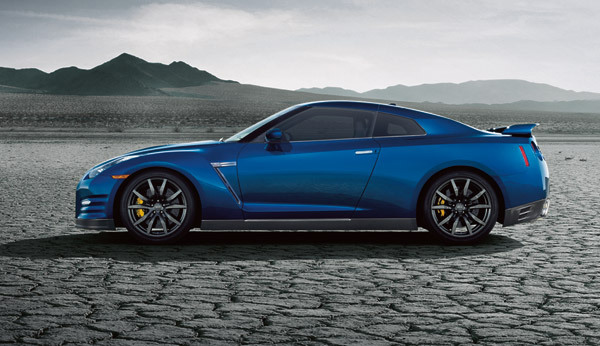 The GT-R has been upgraded in the 2013 models to 580 hp. The results of the first race may have been based on the Nissan’s tune-up, because it raced for first with the Ducati, while leaving the Reventon far behind after a poor launch. When the Ducati opted out of a second race, the GT-R triumphed again, despite the Lamborghini’s improved launch. In one final race, the all-wheel-drive supercars raced from a rolling start. So which car won the third and final race? You’ll have to check out the video below for the answer! For a list of our award winning Nissans please visit www.jamescerantinissan.net or come see us at our Greeneville Store! The Nissan Juke-R combination of the Juke and GT-R into a super crossover vehicle has finally made it to the important stage of testing. Nissan engineers take the Juke-R to the track to unleash it through tests to see what the machine is all about! Shaking down the car to make sure the Juke-R is operating correctly is important to see that all of the components are working together without issues. Workers will be pushing the limits of the Juke-R to see what type of performance numbers the vehicle can attain. Safety is also a major factor with testing the Juke-R to make sure the car is handling and holding together correctly. Watch and enjoy! All of the Juke-R episodes can be viewed at www.youtube.com/user/NissanJuke. The idea of combining a Nissan Juke and a GT-R together was a wild one but Nissan engineers have made the most of the experience so far. Combining the two vehicles into one supercar crossover, the Juke-R, is quite a task for engineers to overcome the differences in the two models. With the brightest minds together, they continue to push forward in creating the amazing concept vehicle. The latest episode of the Juke-R series depicts Nissan engineers working diligently on a roll cage to help make the vehicle prepared for the GT-R’s speed and power as well as suspension set-up for the vehicle difference of height and weight. All of the Juke-R construction videos can be found on the Nissan Juke’s YouTube Channel. Enjoy the current episode and make sure to watch all of the others!